Seventeen new Sustainable Development Goals were projected onto the United Nations Secretariat building in New York, debated at the UN Summit, broadcast in a four minute Global Goals video and squeezed between performances by Coldplay, Beyoncé and Pearl Jam at the Global Citizen Festival. The Goals set out what the UN wants to achieve in the next fifteen years: from ending hunger and poverty to achieving gender equality. Keep your moonshots, it doesn't get bigger than this. Sustainable Development Goal 3.2 is simple: by 2030, end preventable deaths of newborns and children under 5 years of age. The University of Huddersfield is one of the institutions tackling the problem of the 2.8 million newborn deaths that occur every year, 2 million of which take place in just ten countries. Its WAAA! 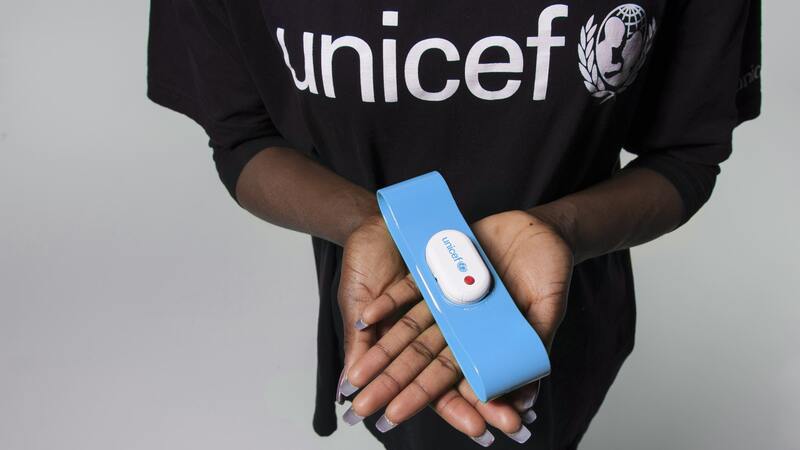 project, a low cost, neonatal wearable sensor system, is one of ten finalists in UNICEF's Wearables for Good challenge. In fact it's the single finalist from the UK in the competition which received 250 entries from 46 countries. Ahead of the announcement of two winners of $15,000 incubation prizes on 12 November at SLUSH in Helsinki, Wareable spoke to Dr. David Swann, reader in Design at the University of Huddersfield, about the potential impact of his team's connected wearable for newborn babies. WAAA! is a bit of a funny name for a wearable but what it stands for is pretty important. WAAA! = wearable, anytime, anywhere, APGAR. The first three of those are self-explanatory but it's APGAR that saves newborns' lives. It's a universally recognised scale for assessing the vital signs of babies in the first minute, hour and day of their life. APGAR helps healthcare workers and parents to monitor appearance, pulse, grimace, activity and respiration in newborns to avoid infections, pneumonia in particular. With 40 million unattended births around the world, the University of Huddersfield team is looking to replace the need for clinical training for two of the five tools with wearable tech: pulse and respiration. The remaining three can be identified visually by educated parents. In order to keep costs as low as possible, WAAA! is only as smart as it needs to be. "We're trying to be a bit intelligent in where we apply the technology so we can do low cost training to fill the gaps," Dr. Swann told Wareable. "That's why our wearable only looks at pulse and respiratory because it can de-skill that clinical process." The WAAA! wearable is a sensor module that slots into a silicone band that is worn around the newborn's chest. It monitors ECG signals and heart rate as well the strain to the bottom of the housing from the expansion of the baby's chest cavity to track respiratory effort. It then combines heart rate and respiratory effort levels at intervals to determine if they are within healthy limits. Abnormal signs are transmitted to the companion gateway box via radio frequency, rather than Bluetooth or Wi-Fi, and details are then sent via SMS to a local healthcare worker. It is designed to be delivered to prospective parents and used over the course of three days around the time of the birth. "When the problem is really complex, the range of potential solutions that will actually deliver is really, really small," explained Dr. Swann. "Whereas if you have a very low key problem, like designing an iPad, the range of possible solutions is vast. "So it's proportionally inverse. Because there's so many stakeholders involved in that decision making process, over a number of years, is that eventually it becomes something called a satisfice solution, something that satisfies the basic requirements and can actually deliver that. What happens is you take the design out of the design. That is a common attribute of many global innovation products. You strip away everything so you end up with something that is just good enough." The University of Huddersfield's team came together to win an internal $15,000 innovation prize based on an early iteration of the WAAA! project before entering the UNICEF challenge. It includes Dr. Julia Meaton, senior lecturer in risk, disaster and environment management; Professor Minhua Ma, head of art and communication; Dr. Haydn Martin, senior lecturer specialising in metrology and Dr. Serena McCluskey, principal research fellow in applied psychological and health research. If WAAA! wins the incubation prize in November, Swann and his team plan to work with the partners involved in the challenge - UNICEF, ARM and Frog - as well as companies such as 3M and Digi who have already collaborated on the project to make a pilot scheme of 100 units a reality. 3M was valuable in analysing the cost of a consumable adhesive patch which lead the team to scrap that initial idea and pivot to a sensor and band setup. The scheme would take place in Uganda for a number of reasons. UNICEF already has global innovation projects rolling out in the country which WAAA! could piggyback onto thereby saving money by not starting from scratch. As well as working towards the Sustainable Development Goals, the project also fits into the WHO and UNICEF's own goals for reducing newborn deaths. UNICEF is aiming to reduce the number to 10 or less, per 1,000 births by 2035 and the Republic of Uganda's goals are also to hit the target of 10 or less per 1,000 from the current levels of 27 deaths per 1,000 births. In Uganda, only 11% of births have neonatal care within 48 hours and the University of Huddersfield team hopes to play a part in increasing this to the ambitious target of 70% by 2017. As Uganda has one midwife for every 7,000 births, connected wearables like WAAA! could make an incredible difference. Each WAAA! system would cost as little as $38 if a full scale rollout of 10,000 units was initiated and even for the 100 unit pilot, the cost would only be $134 each. For a large scale project, the cost per birth would be just $0.32. "We've got some basic knowledge in terms of how many births each of the 83,000 healthcare workers in Uganda might attend to," said Dr. Swann. "And at any one time, 15 people in their caseload of 150 households are pregnant. So we made some basic calculations for the pilot scheme that the product will be used 40 times a year." "If that box had a second wearable, then obviously we're doing 80 times a year," he said. "If that cost of investment was spread over three years, the price per birth falls. We are trying to put a stake in the sand saying we can deliver a higher standard of care for around 30 cents per birth." WAAA! PRODUCT_ MOCK_UP_ANIMATION from David Swann on Vimeo. The team's calculations are based on a pilot scheme funded by winnings from the UNICEF challenge and other partners and distributed through UNICEF's supply division. But Swann admits that were WAAA! to be developed into a commercial product, a business case would have to be worked out. The next step for the academics at the University of Huddersfield are to continue to work on the business case in detail. Rival standalone products which connect to smartphone apps retail for $150 in the US but don't have the system behind them to be relevant in developing countries. The team is also still working out what constitutes a WAAA! system - one, two or three wearables, say. Apart from that, winning the UNICEF prize is of the utmost importance in terms of the leverage associated with the charity. As Swann says, "At the moment, we're just waiting for the result."